This article is about the communications medium. For the former manufacturing conglomerate, see Email Limited. "Inbox" redirects here. For the discontinued Google product, see Inbox by Gmail. Electronic mail (email or e-mail) is a method of exchanging messages ("mail") between people using electronic devices. Invented by Ray Tomlinson, email first entered limited use in the 1960s and by the mid-1970s had taken the form now recognized as email. Email operates across computer networks, which today is primarily the Internet. Some early email systems required the author and the recipient to both be online at the same time, in common with instant messaging. Today's email systems are based on a store-and-forward model. Email servers accept, forward, deliver, and store messages. Neither the users nor their computers are required to be online simultaneously; they need to connect only briefly, typically to a mail server or a webmail interface for as long as it takes to send or receive messages. Originally an ASCII text-only communications medium, Internet email was extended by Multipurpose Internet Mail Extensions (MIME) to carry text in other character sets and multimedia content attachments. International email, with internationalized email addresses using UTF-8, has been standardized, but as of 2017[update] it has not been widely adopted. The history of modern Internet email services reaches back to the early ARPANET, with standards for encoding email messages published as early as 1973 (RFC 561). An email message sent in the early 1970s looks very similar to a basic email sent today. Email had an important role in creating the Internet, and the conversion from ARPANET to the Internet in the early 1980s produced the core of the current services. email is the most common form used online, and is required by IETF Requests for Comments (RFC) and working groups and increasingly by style guides. This spelling also appears in most dictionaries. e-mail is the format that sometimes appears in edited, published American English and British English writing as reflected in the Corpus of Contemporary American English data, but is falling out of favor in some style guides. mail was the form used in the original protocol standard, RFC 524. The service is referred to as mail, and a single piece of electronic mail is called a message. An Internet e-mail consists of an envelope and content; the content in turn consists of a header and a body. Computer-based mail and messaging became possible with the advent of time-sharing computers in the early 1960s, and informal methods of using shared files to pass messages were soon expanded into the first mail systems. Most developers of early mainframes and minicomputers developed similar, but generally incompatible, mail applications. Over time, a complex web of gateways and routing systems linked many of them. Many US universities were part of the ARPANET (created in the late 1960s), which aimed at software portability between its systems. That portability helped make the Simple Mail Transfer Protocol (SMTP) increasingly influential. For a time in the late 1980s and early 1990s, it seemed likely that either a proprietary commercial system or the X.400 email system, part of the Government Open Systems Interconnection Profile (GOSIP), would predominate. However, once the final restrictions on carrying commercial traffic over the Internet ended in 1995, a combination of factors made the current Internet suite of SMTP, POP3 and IMAP email protocols the standard. The MUA formats the message in email format and uses the submission protocol, a profile of the Simple Mail Transfer Protocol (SMTP), to send the message content to the local mail submission agent (MSA), in this case smtp.a.org. The MSA determines the destination address provided in the SMTP protocol (not from the message header), in this case bob@b.org which is a fully qualified domain address (FQDA). The part before the @ sign is the local part of the address, often the username of the recipient, and the part after the @ sign is a domain name. The MSA resolves a domain name to determine the fully qualified domain name of the mail server in the Domain Name System (DNS). 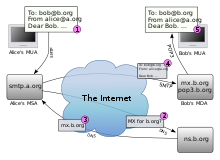 The DNS server for the domain b.org (ns.b.org) responds with any MX records listing the mail exchange servers for that domain, in this case mx.b.org, a message transfer agent (MTA) server run by the recipient's ISP. Many MTAs used to accept messages for any recipient on the Internet and do their best to deliver them. Such MTAs are called open mail relays. This was very important in the early days of the Internet when network connections were unreliable. However, this mechanism proved to be exploitable by originators of unsolicited bulk email and as a consequence open mail relays have become rare, and many MTAs do not accept messages from open mail relays. The basic Internet message format used for email, is now defined by RFC 5322, with encoding of non-ASCII data and multimedia content attachments being defined in RFC 2045 through RFC 2049, collectively called Multipurpose Internet Mail Extensions or MIME. The extensions in International email apply only to email. RFC 5322 replaced the earlier RFC 2822 in 2008, and in turn RFC 2822 in 2001 replaced RFC 822 – which had been the standard for Internet email for nearly 20 years. Published in 1982, RFC 822 was based on the earlier RFC 733 for the ARPANET. Internet email messages consist of two major sections, the message header and the message body, collectively known as content. The header is structured into fields such as From, To, CC, Subject, Date, and other information about the email. In the process of transporting email messages between systems, SMTP communicates delivery parameters and information using message header fields. The body contains the message, as unstructured text, sometimes containing a signature block at the end. The header is separated from the body by a blank line. RFC 5322 specifies the syntax of the email header. Each email message has a header (the "header section" of the message, according to the specification), comprising a number of fields ("header fields"). Each field has a name ("field name" or "header field name"), which is followed by the separator character ":", and a value ("field body" or "header field body"). Each field name must start in the first character of a new line in the header section and begin with a non-whitespace printable character. It ends with the separator character ":". The separator is then followed by the field value (the "field body"). The value can continue onto subsequent lines if those lines have a space or tab as their first character. Field names and, without SMTPUTF8, field bodies are restricted to 7-bit ASCII characters. Some non-ASCII values may be represented using MIME encoded words. Email header fields can be multi-line, with each line recommended to be no more than 78 characters, although the technical limit is 998 characters. Header fields defined by RFC 5322 contain only US-ASCII characters; for encoding characters in other sets, a syntax specified in RFC 2047 can be used. Recently the IETF EAI working group has defined some standards track extensions, replacing previous experimental extensions, to allow UTF-8 encoded Unicode characters to be used within the header. In particular, this allows email addresses to use non-ASCII characters. Such addresses are supported by Google and Microsoft products, and promoted by some governments. Date: The local time and date when the message was written. Like the From: field, many email clients fill this in automatically when sending. The recipient's client may then display the time in the format and time zone local to them. Subject: A brief summary of the topic of the message. Certain abbreviations are commonly used in the subject, including "RE:" and "FW:". Precedence: commonly with values "bulk", "junk", or "list"; used to indicate that automated "vacation" or "out of office" responses should not be returned for this mail, e.g. to prevent vacation notices from being sent to all other subscribers of a mailing list. Sendmail uses this field to affect prioritization of queued email, with "Precedence: special-delivery" messages delivered sooner. With modern high-bandwidth networks, delivery priority is less of an issue than it once was. Microsoft Exchange respects a fine-grained automatic response suppression mechanism, the X-Auto-Response-Suppress field. Other fields that are added on top of the header by the receiving server may be called trace fields, in a broader sense. Authentication-Results: when a server carries out authentication checks, it can save the results in this field for consumption by downstream agents. Auto-Submitted: is used to mark automatically generated messages. Internet email was originally designed for 7-bit ASCII. Most email software is 8-bit clean but must assume it will communicate with 7-bit servers and mail readers. The MIME standard introduced character set specifiers and two content transfer encodings to enable transmission of non-ASCII data: quoted printable for mostly 7-bit content with a few characters outside that range and base64 for arbitrary binary data. The 8BITMIME and BINARY extensions were introduced to allow transmission of mail without the need for these encodings, but many mail transport agents still do not support them fully. In some countries, several encoding schemes coexist; as the result, by default, the message in a non-Latin alphabet language appears in non-readable form (the only exception is coincidence, when the sender and receiver use the same encoding scheme). Therefore, for international character sets, Unicode is growing in popularity. Most modern graphic email clients allow the use of either plain text or HTML for the message body at the option of the user. HTML email messages often include an automatically generated plain text copy as well, for compatibility reasons. Advantages of HTML include the ability to include in-line links and images, set apart previous messages in block quotes, wrap naturally on any display, use emphasis such as underlines and italics, and change font styles. Disadvantages include the increased size of the email, privacy concerns about web bugs, abuse of HTML email as a vector for phishing attacks and the spread of malicious software. Some web-based mailing lists recommend that all posts be made in plain-text, with 72 or 80 characters per line for all the above reasons, but also because they have a significant number of readers using text-based email clients such as Mutt. Some Microsoft email clients allow rich formatting using their proprietary Rich Text Format (RTF), but this should be avoided unless the recipient is guaranteed to have a compatible email client. The interface of an email client, Thunderbird. Messages are exchanged between hosts using the Simple Mail Transfer Protocol with software programs called mail transfer agents (MTAs); and delivered to a mail store by programs called mail delivery agents (MDAs, also sometimes called local delivery agents, LDAs). Accepting a message obliges an MTA to deliver it, and when a message cannot be delivered, that MTA must send a bounce message back to the sender, indicating the problem. Users can retrieve their messages from servers using standard protocols such as POP or IMAP, or, as is more likely in a large corporate environment, with a proprietary protocol specific to Novell Groupwise, Lotus Notes or Microsoft Exchange Servers. Programs used by users for retrieving, reading, and managing email are called mail user agents (MUAs). Many current email users do not run MTA, MDA or MUA programs themselves, but use a web-based email platform, such as Gmail or Yahoo! Mail, that performs the same tasks. 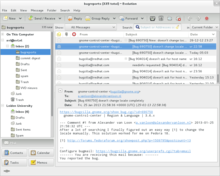 Such webmail interfaces allow users to access their mail with any standard web browser, from any computer, rather than relying on an email client. Used by many email clients including Novell GroupWise, Microsoft Outlook Express, Lotus notes, Windows Mail, Mozilla Thunderbird, and Postbox. The files contain the email contents as plain text in MIME format, containing the email header and body, including attachments in one or more of several formats. The URI scheme, as registered with the IANA, defines the mailto: scheme for SMTP email addresses. Though its use is not strictly defined, URLs of this form are intended to be used to open the new message window of the user's mail client when the URL is activated, with the address as defined by the URL in the To: field. Many email providers have a web-based email client (e.g. AOL Mail, Gmail, Outlook.com, Hotmail and Yahoo! Mail). This allows users to log into the email account by using any compatible web browser to send and receive their email. Mail is typically not downloaded to the client, so can't be read without a current Internet connection. Messaging Application Programming Interface (MAPI) is used by Microsoft Outlook to communicate to Microsoft Exchange Server - and to a range of other email server products such as Axigen Mail Server, Kerio Connect, Scalix, Zimbra, HP OpenMail, IBM Lotus Notes, Zarafa, and Bynari where vendors have added MAPI support to allow their products to be accessed directly via Outlook. Email has been widely accepted by business, governments and non-governmental organizations in the developed world, and it is one of the key parts of an 'e-revolution' in workplace communication (with the other key plank being widespread adoption of highspeed Internet). A sponsored 2010 study on workplace communication found 83% of U.S. knowledge workers felt email was critical to their success and productivity at work. Much of the business world relies on communications between people who are not physically in the same building, area, or even country; setting up and attending an in-person meeting, telephone call, or conference call can be inconvenient, time-consuming, and costly. Email provides a method of exchanging information between two or more people with no set-up costs and that is generally far less expensive than a physical meeting or phone call. With real time communication by meetings or phone calls, participants must work on the same schedule, and each participant must spend the same amount of time in the meeting or call. Email allows asynchrony: each participant may control their schedule independently. Sending an email is much less expensive than sending postal mail, or long distance telephone calls, telex or telegrams. Much faster than most of the alternatives. Unlike a telephone or in-person conversation, email by its nature creates a detailed written record of the communication, the identity of the sender(s) and recipient(s) and the date and time the message was sent. In the event of a contract or legal dispute, saved emails can be used to prove that an individual was advised of certain issues, as each email has the date and time recorded on it. Email marketing via "opt-in" is often successfully used to send special sales offerings and new product information. Depending on the recipient's culture, email sent without permission—such as an "opt-in"—is likely to be viewed as unwelcome "email spam". Many users access their personal email from friends and family members using a personal computer in their house or apartment. Email has become used on smartphones and on all types of computers. Mobile "apps" for email increase accessibility to the medium for users who are out of their home. While in the earliest years of email, users could only access email on desktop computers, in the 2010s, it is possible for users to check their email when they are away from home, whether they are across town or across the world. Alerts can also be sent to the smartphone or other device to notify them immediately of new messages. This has given email the ability to be used for more frequent communication between users and allowed them to check their email and write messages throughout the day. As of 2011[update], there were approximately 1.4 billion email users worldwide and 50 billion non-spam emails that were sent daily. Individuals often check email on smartphones for both personal and work-related messages. It was found that US adults check their email more than they browse the web or check their Facebook accounts, making email the most popular activity for users to do on their smartphones. 78% of the respondents in the study revealed that they check their email on their phone. It was also found that 30% of consumers use only their smartphone to check their email, and 91% were likely to check their email at least once per day on their smartphone. However, the percentage of consumers using email on smartphone ranges and differs dramatically across different countries. For example, in comparison to 75% of those consumers in the US who used it, only 17% in India did. As of 2010[update], the number of Americans visiting email web sites had fallen 6 percent after peaking in November 2009. For persons 12 to 17, the number was down 18 percent. Young people preferred instant messaging, texting and social media. Technology writer Matt Richtel said in The New York Times that email was like the VCR, vinyl records and film cameras—no longer cool and something older people do. A 2015 survey of Android users showed that persons 13 to 24 used messaging apps 3.5 times as much as those over 45, and were far less likely to use email. Email messages may have one or more attachments, which are additional files that are appended to the email. Typical attachments include Microsoft Word documents, pdf documents and scanned images of paper documents. In principle there is no technical restriction on the size or number of attachments, but in practice email clients, servers and Internet service providers implement various limitations on the size of files, or complete email - typically to 25MB or less. Furthermore, due to technical reasons, attachment sizes as seen by these transport systems can differ to what the user sees, which can be confusing to senders when trying to assess whether they can safely send a file by email. Where larger files need to be shared, file hosting services of various sorts are available; and generally suggested. The ubiquity of email for knowledge workers and "white collar" employees has led to concerns that recipients face an "information overload" in dealing with increasing volumes of email. With the growth in mobile devices, by default employees may also receive work-related emails outside of their working day. This can lead to increased stress, decreased satisfaction with work, and some observers even argue it could have a significant negative economic effect, as efforts to read the many emails could reduce productivity. Email "spam" is the term used to describe unsolicited bulk email. The low cost of sending such email meant that by 2003 up to 30% of total email traffic was already spam, and was threatening the usefulness of email as a practical tool. The US CAN-SPAM Act of 2003 and similar laws elsewhere had some impact, and a number of effective anti-spam techniques now largely mitigate the impact of spam by filtering or rejecting it for most users, but the volume sent is still very high—and increasingly consists not of advertisements for products, but malicious content or links. In September 2017, for example, the proportion of spam to legitimate email rose to 59.56%. A range of malicious email types exist. These range from various types of email scams, including "social engineering" scams such as advance-fee scam "Nigerian letters", to phishing, email bombardment and email worms. Email spoofing occurs when the email message header is designed to make the message appear to come from a known or trusted source. Email spam and phishing methods typically use spoofing to mislead the recipient about the true message origin. Email spoofing may be done as a prank, or as part of a criminal effort to defraud an individual or organization. An example of a potentially fraudulent email spoofing is if an individual creates an email which appears to be an invoice from a major company, and then sends it to one or more recipients. In some cases, these fraudulent emails incorporate the logo of the purported organization and even the email address may appear legitimate. Email bombing is the intentional sending of large volumes of messages to a target address. The overloading of the target email address can render it unusable and can even cause the mail server to crash. web bugs invisibly embedded in email content can alert the sender of any email whenever an email is read, or re-read, and from which IP address. It can also reveal whether an email was read on a smartphone or a PC, or Apple Mac device via the user agent string. There are cryptography applications that can serve as a remedy to one or more of the above. For example, Virtual Private Networks or the Tor anonymity network can be used to encrypt traffic from the user machine to a safer network while GPG, PGP, SMEmail, or S/MIME can be used for end-to-end message encryption, and SMTP STARTTLS or SMTP over Transport Layer Security/Secure Sockets Layer can be used to encrypt communications for a single mail hop between the SMTP client and the SMTP server. Additionally, many mail user agents do not protect logins and passwords, making them easy to intercept by an attacker. Encrypted authentication schemes such as SASL prevent this. Finally, attached files share many of the same hazards as those found in peer-to-peer filesharing. Attached files may contain trojans or viruses. Flaming occurs when a person sends a message (or many messages) with angry or antagonistic content. The term is derived from the use of the word "incendiary" to describe particularly heated email discussions. The ease and impersonality of email communications mean that the social norms that encourage civility in person or via telephone do not exist and civility may be forgotten. Also known as "email fatigue", email bankruptcy is when a user ignores a large number of email messages after falling behind in reading and answering them. The reason for falling behind is often due to information overload and a general sense there is so much information that it is not possible to read it all. As a solution, people occasionally send a "boilerplate" message explaining that their email inbox is full, and that they are in the process of clearing out all the messages. Harvard University law professor Lawrence Lessig is credited with coining this term, but he may only have popularized it. Originally Internet email was completely ASCII text-based. MIME now allows body content text and some header content text in international character sets, but other headers and email addresses using UTF-8, while standardized have yet to be widely adopted. Delivery Reports can be used to verify whether an address exists and if so, this indicates to a spammer that it is available to be spammed. If the spammer uses a forged sender email address (email spoofing), then the innocent email address that was used can be flooded with NDRs from the many invalid email addresses the spammer may have attempted to mail. These NDRs then constitute spam from the ISP to the innocent user. In the absence of standard methods, a range of system based around the use of web bugs have been developed. However, these are often seen as underhand or raising privacy concerns, and only work with email clients that support rendering of HTML. Many mail clients now default to not showing "web content". Webmail providers can also disrupt web bugs by pre-caching images. ^ "RFC 5321 – Simple Mail Transfer Protocol". Network Working Group. Archived from the original on 16 January 2015. Retrieved 19 January 2015. ^ a b "DataMail: World's first free linguistic email service supports eight India languages". Archived from the original on 2016-10-22. ^ Ron Brown, Fax invades the mail market, New Scientist Archived 2016-05-09 at the Wayback Machine, Vol. 56, No. 817 (Oct., 26, 1972), pages 218–221. ^ Google Ngram Viewer. Archived from the original on 2013-05-16. Retrieved 2013-04-21. ^ "Yahoo style guide". Styleguide.yahoo.com. Archived from the original on May 9, 2013. Retrieved 2014-01-09. ^ "Reference.com". Dictionary.reference.com. Archived from the original on 2013-12-16. Retrieved 2014-01-09. ^ "Merriam-Webster Dictionary". Merriam-Webster. Archived from the original on 12 May 2014. Retrieved 9 May 2014. ^ ""Email" or "e-mail"". English Language & Usage – Stack Exchange. August 25, 2010. Archived from the original on August 31, 2010. Retrieved September 26, 2010. ^ Gerri Berendzen; Daniel Hunt. "AP changes e-mail to email". 15th National Conference of the American Copy Editors Society (2011, Phoenix). ACES. Archived from the original on 22 March 2011. Retrieved 23 March 2011. ^ "RFC 524 (rfc524) – A Proposed Mail Protocol". Faqs.org. 1973-06-13. Archived from the original on 2016-04-03. Retrieved 2016-11-18. ^ a b "RFC 1939 (rfc1939) – Post Office Protocol – Version 3". Faqs.org. Archived from the original on 2014-01-07. Retrieved 2014-01-09. ^ a b "RFC 3501 (rfc3501) – Internet Message Access Protocol – version 4rev1". Faqs.org. Archived from the original on 2014-01-07. Retrieved 2014-01-09. ^ ""RFC Style Guide", Table of decisions on consistent usage in RFC". Archived from the original on 2013-12-28. Retrieved 2014-01-09. ^ "Excerpt from the FAQ list of the Usenet newsgroup alt.usage.english". Alt-usage-english.org. Archived from the original on 2012-04-03. Retrieved 2014-01-09. ^ "Mail Objects". Simple Mail Transfer Protocol. IETF. sec. 2.3.1. doi:10.17487/RFC5321. RFC 5321. SMTP transports a mail object. A mail object contains an envelope and content. ^ Leiner, Barry M.; Cerf, Vinton G.; Clark, David D.; Kahn, Robert E.; Kleinrock, Leonard; Lynch, Daniel C.; Postel, Jon; Roberts, Larry G.; Wolf, Stephen (1999). "A Brief History of the Internet". arXiv:cs/9901011. Bibcode:1999cs........1011L. Archived from the original on 2015-08-11. ^ How E-mail Works. howstuffworks.com. 2008. Archived from the original on 2017-06-11. ^ "What is open relay?". WhatIs.com. Indiana University. 2004-07-19. Archived from the original on 2007-08-24. Retrieved 2008-04-07. ^ Ch Seetha Ram (2010). Information Technology for Management. Deep & Deep Publications. p. 164. ISBN 978-81-8450-267-1. ^ Hoffman, Paul (2002-08-20). "Allowing Relaying in SMTP: A Series of Surveys". IMC Reports. Internet Mail Consortium. Archived from the original on 2007-01-18. Retrieved 2008-04-13. ^ Simpson, Ken (October 3, 2008). "An update to the email standards". MailChannels Blog Entry. Archived from the original on October 6, 2008. ^ J. Klensin (October 2008), "Mail Objects", Simple Mail Transfer Protocol, sec. 2.3.1., doi:10.17487/RFC5321, RFC 5321, SMTP transports a mail object. A mail object contains an envelope and content. ... The SMTP content is sent in the SMTP DATA protocol unit and has two parts: the header section and the body. ^ D. Crocker (July 2009), "Message Data", Internet Mail Architecture, sec. 4.1., doi:10.17487/RFC5598, RFC 5598, A message comprises a transit-handling envelope and the message content. The envelope contains information used by the MHS. The content is divided into a structured header and the body. ^ P. Resnick, Ed. (October 2008). "RFC 5322, Internet Message Format". IETF. Archived from the original on 2015-02-22. ^ Moore, K (November 1996). "MIME (Multipurpose Internet Mail Extensions) Part Three: Message Header Extensions for Non-ASCII Text". IETF. Archived from the original on 2012-01-14. Retrieved 2012-01-21. ^ A Yang, Ed. (February 2012). "RFC 6532, Internationalized Email Headers". IETF. ISSN 2070-1721. Archived from the original on 2015-02-18. ^ "Now, get your email address in Hindi - The Economic Times". The Economic Times. Archived from the original on 2016-08-28. Retrieved 2016-10-17. ^ "RFC 5322, 3.6. Field Definitions". Tools.ietf.org. October 2008. Archived from the original on 2013-12-30. Retrieved 2014-01-09. ^ "RFC 5322, 3.6.4. Identification Fields". Tools.ietf.org. October 2008. Archived from the original on 2013-12-30. Retrieved 2014-01-09. ^ "RFC 5064". Tools.ietf.org. December 2007. Archived from the original on 2014-07-25. Retrieved 2014-01-09. ^ John Klensin (October 2008). "Trace Information". Simple Mail Transfer Protocol. IETF. sec. 4.4. doi:10.17487/RFC5321. RFC 5321. ^ This extensible field is defined by RFC 7001, that also defines an IANA registry of Email Authentication Parameters. ^ Defined in RFC 3834, and updated by RFC 5436. ^ Craig Hunt (2002). TCP/IP Network Administration. O'Reilly Media. p. 70. ISBN 978-0-596-00297-8. ^ "When posting to a RootsWeb mailing list..." Helpdesk.rootsweb.com. Archived from the original on 2014-02-19. Retrieved 2014-01-09. ^ "...Plain text, 72 characters per line..." Openbsd.org. Archived from the original on 2014-02-08. Retrieved 2014-01-09. ^ "How to Prevent the Winmail.dat File from Being Sent to Internet Users". Support.microsoft.com. 2010-07-02. Archived from the original on 2014-01-09. Retrieved 2014-01-09. ^ "Free Email Providers in the Yahoo! Directory". dir.yahoo.com. Archived from the original on 2014-07-04. ^ RFC 2368 section 3 : by Paul Hoffman in 1998 discusses operation of the "mailto" URL. ^ a b Hansen, Derek; Smith, Marc A.; Heer, Jeffrey (2011). "E-Mail". In Barnett, George A (ed.). Encyclopedia of social networks. Thousand Oaks, Calif: Sage. p. 245. ISBN 9781412994170. OCLC 959670912. ^ Allen, David (2004). Windows to Linux. Prentice Hall. p. 192. ISBN 978-1423902454. Archived from the original on 2016-12-26. ^ By Om Malik, GigaOm. "Is Email a Curse or a Boon? Archived 2010-12-04 at the Wayback Machine" September 22, 2010. Retrieved October 11, 2010. ^ Martin, Brett A. S.; Van Durme, Joel; Raulas, Mika; Merisavo, Marko (2003). "E-mail Marketing: Exploratory Insights from Finland" (PDF). Journal of Advertising Research. 43 (3): 293–300. doi:10.1017/s0021849903030265. Archived (PDF) from the original on 2012-10-21. ^ Lev, Amir (2009-10-02). "Spam culture, part 1: China". Archived from the original on 2016-11-10. ^ "Email Is Top Activity On Smartphones, Ahead Of Web Browsing & Facebook [Study]". 28 March 2013. Archived from the original on 29 April 2014. ^ "The ultimate mobile email statistics overview". Archived from the original on 2014-07-11. ^ Richtel, Matt (2010-12-20). "E-Mail Gets an Instant Makeover". The New York Times. Retrieved 2018-04-04. ^ Gustini, Ray (2010-12-21). "Why Are Young People Abandoning Email?". The Atlantic. Retrieved 2018-04-04. ^ Perez, Sarah (2016-03-24). "Email is dying among mobile's youngest users". techcrunch.com. Retrieved 2018-04-04. ^ "Setting Message Size Limits in Exchange 2010 and Exchange 2007" Archived 2013-02-12 at the Wayback Machine. ^ "Google updates file size limits for Gmail and YouTube", geek.com Archived 2011-12-19 at the Wayback Machine. ^ "Maximum attachment size", mail.google.com. ^ "Exchange 2007: Attachment Size Increase,..." TechNet Magazine, Microsoft.com US. 2010-03-25. Archived from the original on 2016-08-25. ^ Radicati, Sara. "Email Statistics Report, 2010" (PDF). Archived (PDF) from the original on 2011-09-01. ^ Gross, Doug (October 20, 2010). "Happy Information Overload Day!". CNN. Archived from the original on October 23, 2015. ^ Stross, Randall (2008-04-20). "Struggling to Evade the E-Mail Tsunami". The New York Times. Archived from the original on April 17, 2009. Retrieved May 1, 2010. ^ "Seeing Spam? How To Take Care of Your Google Analytics Data". sitepronews.com. 2015-05-04. Archived from the original on 7 November 2017. Retrieved 5 September 2017. ^ "Kaspersky Lab Spam and Phishing report". ^ SMEmail – A New Protocol for the Secure E-mail in Mobile Environments, Proceedings of the Australian Telecommunications Networks and Applications Conference (ATNAC'08), pp. 39–44, Adelaide, Australia, Dec. 2008. ^ S. Kiesler; D. Zubrow; A.M. Moses; V. Geller (1985). "Affect in computer-mediated communication: an experiment in synchronous terminal-to-terminal discussion". Human-Computer Interaction. 1: 77–104. doi:10.1207/s15327051hci0101_3. ^ Barrett, Grant (December 23, 2007). "All We Are Saying". The New York Times. Archived from the original on April 17, 2009. Retrieved 2007-12-24. ^ "Internationalized Domain Names (IDNs) | Registry.In". registry.in. Archived from the original on 2016-05-13. Retrieved 2016-10-17. ^ "Made In India 'Datamail' Empowers Russia With Email Address In Russian Language - Digital Conqueror". 7 December 2016. Archived from the original on 5 March 2017. ^ Amy Harmon (2000-11-22). "Software That Tracks E-Mail Is Raising Privacy Concerns". The New York Times. Retrieved 2012-01-13. ^ "About.com". Email.about.com. 2013-12-19. Archived from the original on 2018-01-02. Retrieved 2014-01-09. ^ "Webdevelopersnotes.com". Webdevelopersnotes.com. Archived from the original on 2014-01-09. Retrieved 2014-01-09. Look up email or outbox in Wiktionary, the free dictionary. This page was last edited on 13 April 2019, at 23:03 (UTC).